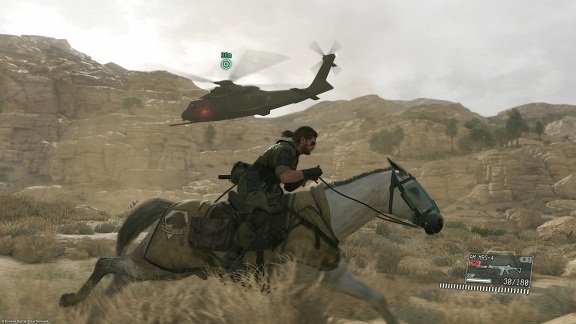 D-Horse is your first companion in MGS 5: The Phantom Pain and available to use after the prologue. It guarantees you a quick progress in the vast areas of Afghanistan and Africa, and can also be used as a diversionary tactic to stop enemy vehicles. Here we explain you everything you need to know about your Buddy D-Horse. D-Horse has 12,000 hit points and stamina 6,000 points. If one of these values drop to 50%, the horse has to lie down and rest. During this time, you don’t ride on D-Horse. Otherwise, you should try to ride on D-Horse as long as possible, because every 36 seconds you gained + 1% relationship value with the horse, where the additional command lot provided for you from 50% Relationship Status (bowel movements / poop). Backwardness - You command D-Horse to move away from you. Do it (Poop/ bowel movement) Relationship: 50% D-Horse will poop at its current position. Light vehicles skid when driving on them and the occupants stunned. You can also move sideways by pressing the X or A button so that the enemies won’t notice you. D-Horse can endure longer in the battle, and you can also develop Battle Dress and other equipment for the horse at the Mother Base. This includes Furicorn, a pitch-black variant.